Spoilers for Atlanta’s “Teddy Perkins” ahead. “Teddy Perkins” will likely go down as one of the wildest episodes of Atlanta – and television, in general – to ever air, leaving viewers with several unanswered questions. For starters: Who was that playing the titular character, a creepy rich recluse who lures Darius (Lakeith Stanfield) to his mansion under the pretenses of acquiring a piano? Vulture can confirm that the man underneath the chalky prosthetics, wig, drawn-on eyebrows, and fake teeth was none other than Donald Glover, in whiteface. We spoke to actor Derrick Haywood, who played Teddy’s wheelchair-bound (and equally disfigured) supposed brother, Benny Hope, about how the episode came together and his theories on Benny’s true identity. Haywood also revealed that Glover went full method, remaining frighteningly in character on set. It still blows my mind. I actually worked on season one, I had one line as a bartender. I got an email from my agent asking me if I was available to do this role. Believe it or not, a week later, they told me to come in for a fitting. The next day, we were shooting the scene. Wow. Did you get a script or was it just a brief description of the role? I got the sides for the role at 1.a.m the day before I filmed the first scene! It was a very difficult role. After watching the episode last night, if I had known the entire script, my approach to the character would’ve changed drastically. It was so challenging to the point that, in between setup and breakdown on set, I had to practice in the wheelchair because I had never been in one before. It was an amazing experience. How it even came about still astonishes me to this day. You filmed all your scenes not knowing the full context of the episode? Yup, I only knew my scenes. I think the idea was they were trying to keep certain aspects of the episode on hush. Initially, I had no idea that Teddy Perkins was actually played by Donald Glover. I was on set, and the director [Hiro Murai] called “Teddy” to come over and said, “Let’s see what Teddy thinks.” I’m like, “Okay, who is this Teddy guy and why is his opinion so important?” Because I had never heard of the guy before. Later, going through and watching, when I say this guy was in character the whole time on set — it was just amazing the commitment he brought to the character. They called him Teddy on set?! Yes! They were calling him Teddy, he acted as Teddy. There was no Donald on set whatsoever. I kid you not. Our engagement on season one compared to our engagement on this episode was drastically different. 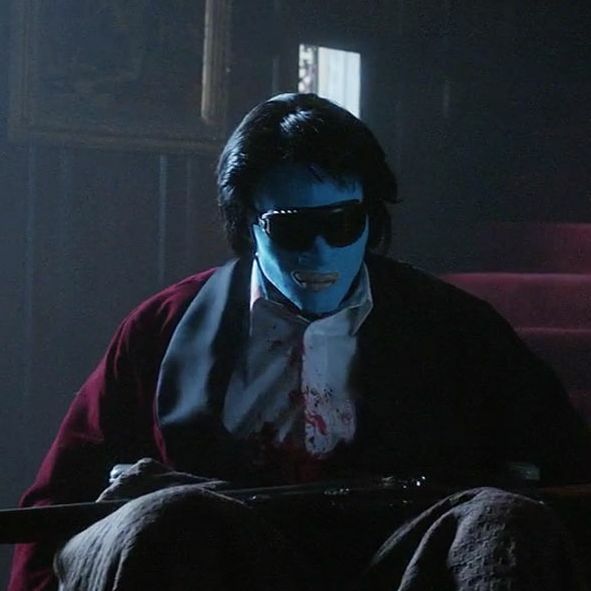 He was really Teddy Perkins on set. Did the way he normally interacts with Lakeith change? I imagine it must’ve creeped out the whole cast and crew to have him lurking around like that. Who would want to interact with him? He even spoke with that chilling, high-pitched voice? Yes! The whole time! There was not an inkling of Donald Glover on that set. It was inspiring. How was it acting opposite him in that final scene with the shooting? By the time we shot that final scene, I kind of knew everything that was taking place. It was a number of takes. I would say we spent half the day on that one scene. It was a very early call time. We actually shot that scene before the scene in the basement. That other scene probably took an hour because we were pushing for time. But we spent the entire day doing different shots of that murder-suicide. Between all three characters, it was hundreds, probably. We spent a total of two or three days at this mansion in a suburb of Atlanta. We didn’t have a lot of rehearsals, but in the down time, I had a conversation with “Teddy” about trying to grasp an older character and to also bring some of Teddy’s mannerisms into Benny’s actions. I also really had to learn how to use that wheelchair, which I was struggling with. You said Benny is supposed to be older. Were you told anything specific about who his character is? I had no idea who Benny was whatsoever. Once I got the sides, I even did some research and couldn’t find anything. But after watching last night’s episode, I had a revelation: Wow, the entire episode is really about Benny. And it’s the first role where I didn’t say anything [laughs]. The lines I had, I wrote down on a chalkboard. But my approach to the character would’ve been totally different had I known the depth of the episode. My process from a character development perspective would’ve been different. The backstory is most important, especially with a role like this where there is nothing to be said. The good thing is, [Hiro] was amazing. He told me that Benny was the brother of Teddy that had this disease and he was a musician just really trying to survive. Because there were some things that Teddy was doing that were unfair from a life perspective; Teddy was somewhat jealous of Benny and his talent and success. So [Hiro] gave direction based on that. Even working with Lakeith and “Teddy,” watching them interact in a scene before they put the camera on me inspired me to want to do a better job with that episode. Again, I didn’t know it was going to be commercial-free. I didn’t know it was going to be about Benny. I’m amazed. Do you still think Benny is just Teddy’s brother, or is there a deeper layer to his character we’re meant to read into? There’s a theory that Benny is Teddy’s father who’s been locked in the basement this whole time and there is no Benny. Teddy is Benny. That makes a lot of sense. But what confuses me is when they show the footage of Benny playing the piano with his father standing there giving him direction. If that’s Benny and that’s his dad, I wouldn’t have thought that Benny is actually the dad. And maybe that’s because they sent me a T-shirt with a picture of the younger Benny on it. Have you spoken with Donald for clarification? Not yet. I want to. It’ll be interesting to see Donald interviewed about it and pick his brain about why he decided to do this and what is the true story behind it. What was the makeup and costuming process like for this role? You’re unrecognizable. It even looks like your lips were bleached or powdered. They were. That was the worst makeup and costuming I’ve ever experienced. I was so hot. Even under the mask of bandages that I had on, I had on this thick plastic to make my face look fuller. Then I had a wig on. So I had plastic sticking to my face because I was sweating. Donald’s makeup was done before I even got to set, and I saw him coming out of the trailer assuming they had just touched him up like they would do me, thinking that was a real person that underwent surgery or something. The makeup team was so wonderful. In between takes, they had to take all this stuff off, put a fan on me, then put it all back on. Did they explain why they wanted to lighten your lips? They wanted me to look more like Teddy — more white — even my wrists. Any skin that showed, they wanted it to look similar to Teddy’s tone to symbolize that we’re brothers. Lakeith shared a since-deleted Instagram photo of you between takes, saying that you never moved a muscle and it creeped him out. Were you stuck because of the amount of material on you? The real issue is I had all of these blankets across my laps, and during the first take, the blanket got caught under the wheelchair. The tires were moving in rotation but the chair wasn’t moving. When you’re on set, you just keep going until the director says “cut.” I couldn’t move. But I committed to Benny!